Our selection of pub and bistro tables is second to none. We have everything you need in metal and wood tables for those intimate evenings on the patio or for small occasions where a big table doesn't make sense. The tables are also used as islands and extra workspace in some rustic kitchens. Tops and bases are interchangeable on some models. Call our friendly sales staff if you have any questions. 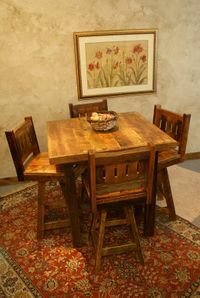 Whether finely crafted or more homespun this rustic furniture will entertain friends and family. Each one is sturdy and crafted to last you for years of patio conversations. LodgeCraft has supplied these tables and bar stools to golf courses and restaurants in NW Montana with many positive results.